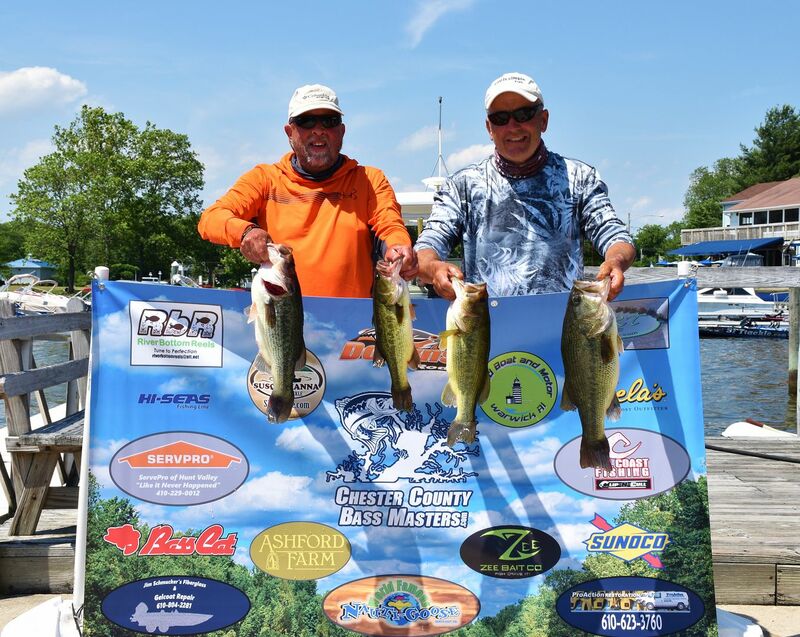 Chester County Bass Masters held their 2nd of five opens for the 2017 season on June 10th out of Anchor Marine in Northeast Maryland. 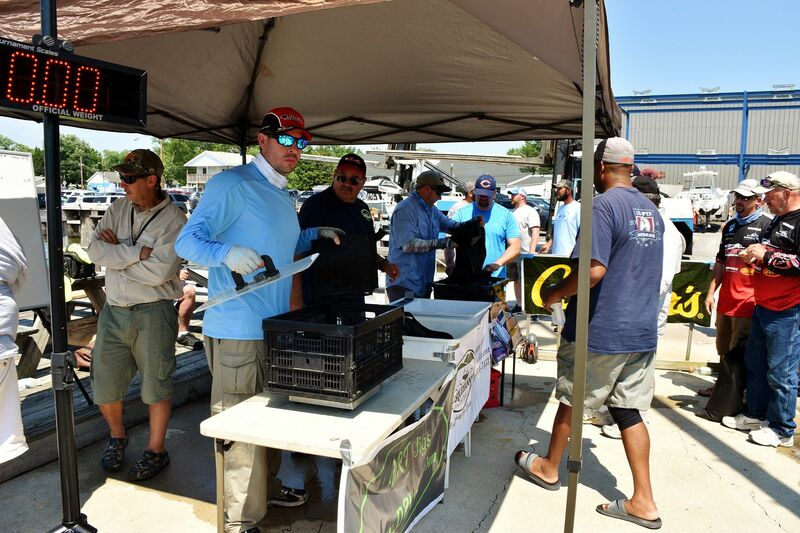 59 Teams showed up on a beautiful late spring Saturday to search for some of the Upper Bay’s black bass. The fish have been finicky this spring with the inundation of rain the past few months causing fluctuating water temps and seemingly endless days of muddy water. Air temps at launch were around 60 with very light wind. The tournament launched at 5:30 under partly cloudy skies with a forecast high of 84. Winds picked up mid morning to the normal 10 - 15. Water temps were in the 70 degree range depending on where you fished. Water color was fairly normal in most areas with some muddy conditions in a few areas. Launch was on low tide with dead low around 5:20. Two flights went out with the first flight due back at 2:30 and second flight at 2:45. 19 five fish limits were brought in with 5 other teams having 4 fish. 25 double digit weights were brought to the scales. 24 bass over 4 pounds were weighed in. 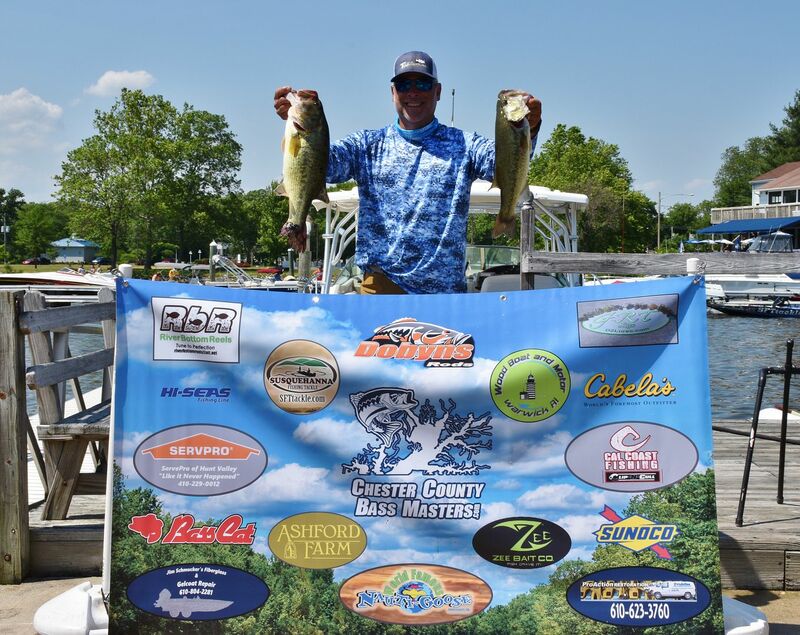 4 bass over 6 pounds were weighed in, 4 in the 5 pound class and 16 in the 4 pound range. 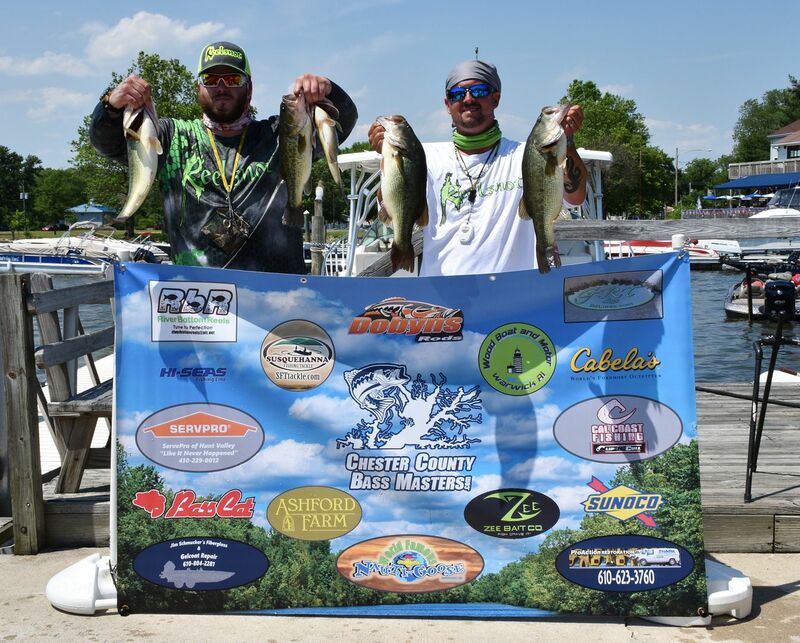 12 cash places were paid, along with 13 sponsor prizes from Susquehanna Tackle, River Bottom Reels, Cabela's of Christiana Mall, Nauti Goose Restaurant, Sunoco, Hi Seas fishing line, Zee Bait Company, Dobyns Rods, GRT Jigs, Bass Cat, and Cal Coast fishing Clip n Cull. Thanks to everyone who came out to fish, we and our sponsors appreciate the support and friendly competition. The next Chester County tournament of 2017 will be on Saturday, August 19th out of Anchor Marine. This will be a special Bi Hourly big fish tournament with a weigh in every 2 hours for the biggest fish. Entry will be $ 125 per boat. Pot will be divided into 4 quarters. Whoever weighs in the biggest bass of each 2 hour weigh in will win that periods cash. Details will be coming soon, watch the Chester County Open facebook page for updates and rules. $ 4,838 in cash was paid along with $ 700 in sponsor prizes. First place cash payout and a pair of championship plaques went to the team of Mike Sentore and Sean McKee, no strangers to the top spot. They brought in a hefty limit just shy of 23 pounds, 22.88 Lbs to take home a nice chunk of change. Included in that impressive bag was a healthy 6.15 fat girl. Congrats to the team on a fantastic day. 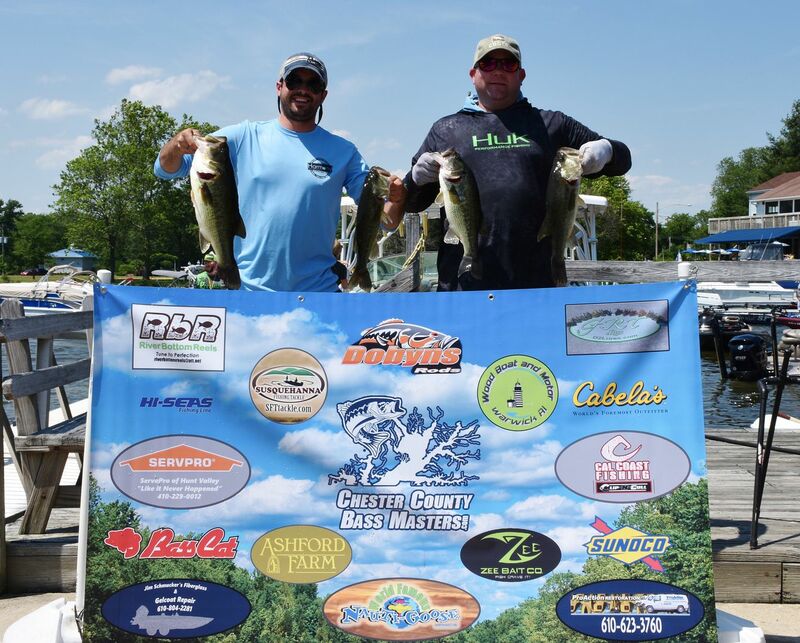 Second place cash went to the team of Terry Roberson and Andrew Chianese who put together an outstanding 5 fish limit weighing in at 22.41 Lbs. The team was less than 1/2 pound off the winning weight. Their big bass weighed in at 5.28 Lbs. Congrats on an exceptional performance. 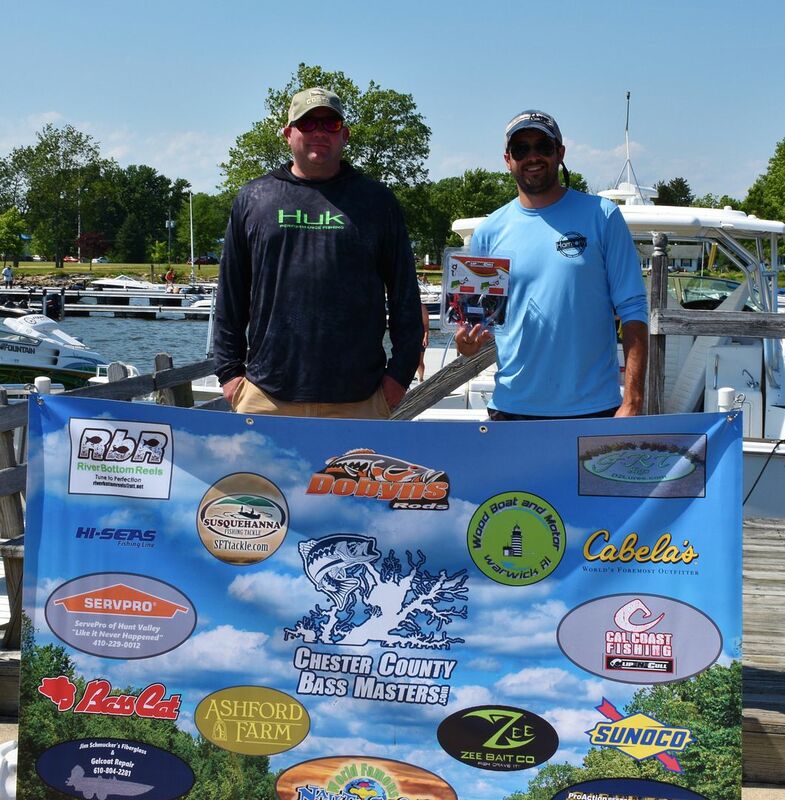 Third place money was won by the team of Lou Croce and Jimmy Pitcherello who brought a 5 fish limit to the scales that topped out at 20.71 Lbs. The team also took home the Susquehanna Fishing Tackle second lunker award, a $ 50.00 gift card to the store with a big fish of 6.32 pounds. Impressive bag on a competitive day. 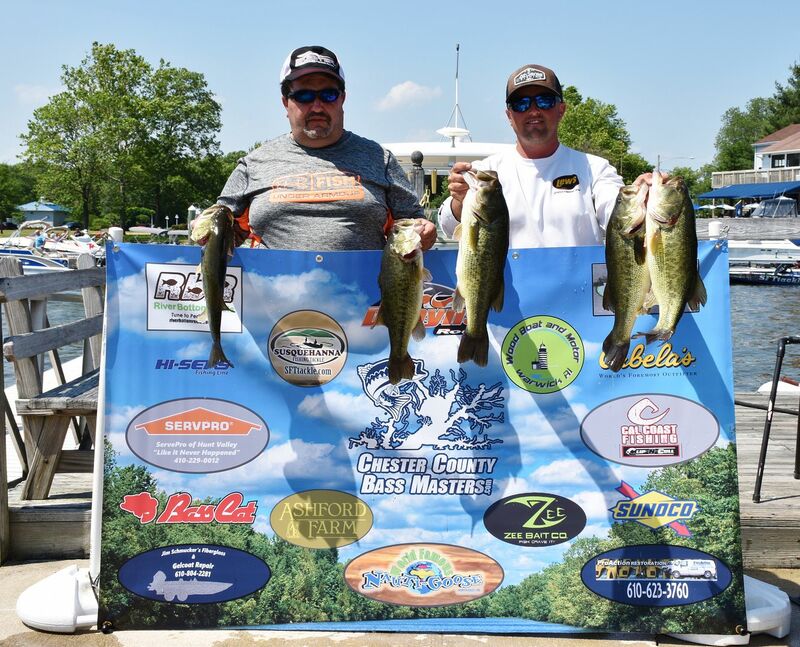 Fourth place dough was earned by the team of Jerry Gerlach and Mark Ely who weighed in a 5 fish limit for 19.55 Lbs with a big fish of 4.72 pounds, another outstanding limit of Upper Bay bass. Fifth place coin went to the team of Jay Burger and Troy Burger who weighed in a nice 5 fish limit of 19.49 Lbs with their big bass going 4.77 pounds. Great work on the day. Sixth place cash was collected by the team of Keith Cowan and John Valdez who brought 5 fish to the scales for 18.99 Lbs. with a big fish of 5.07 lbs. 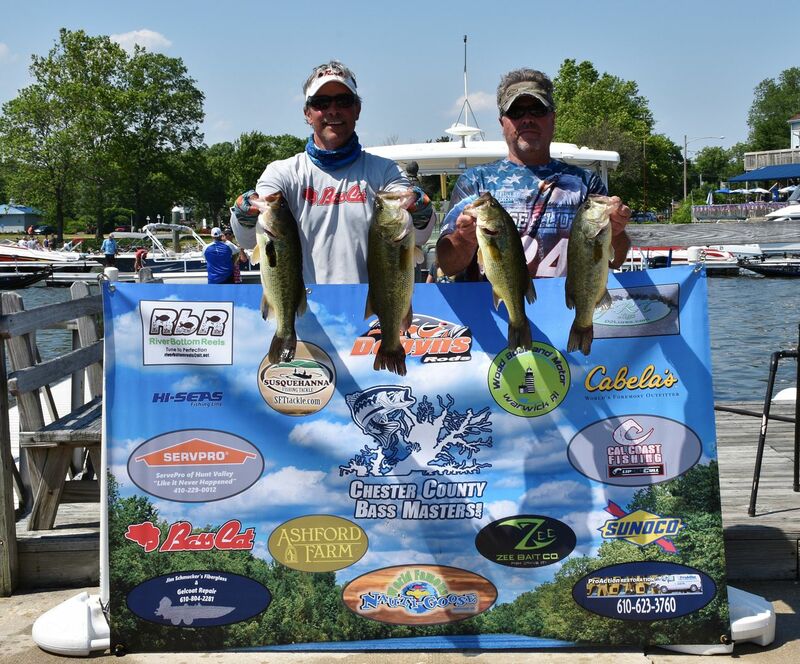 Seventh place money was snagged by the team of Ron Lutz and John Detwiler with a 5 fish limit weighing 18.81 Lbs. Ron and John also took home the $ 590 Tournament Lunker cash with an outstanding Upper Bay giant of 6.38 pounds which is the 2nd biggest fish caught in our 2107 Opens so far. 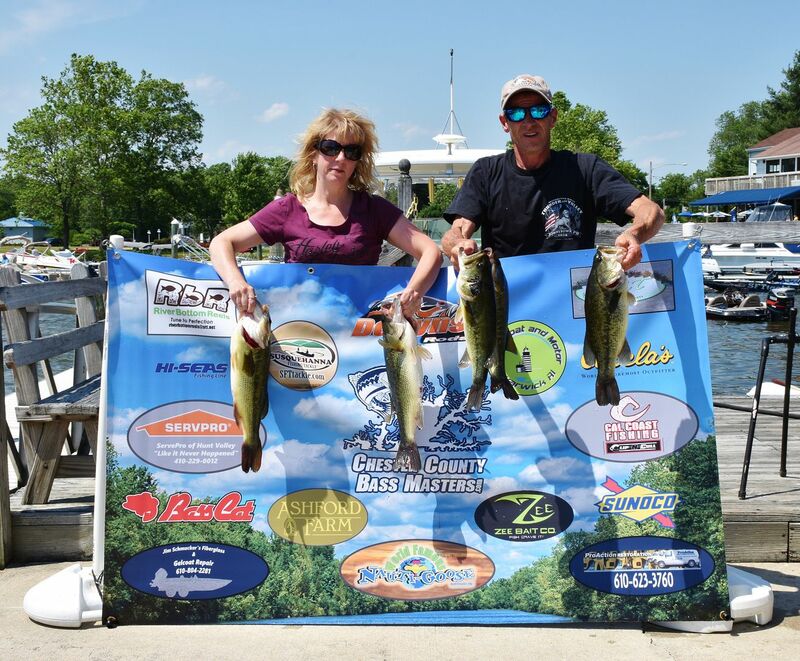 Eighth place money spot was secured by the team of Greg Plank and Kim Noeth who had a 5 bass limit for 18.31 pounds with a big bass of 4.86 pounds. Ninth place cash was collected by the team of Dave Anderson and Matt Macsherry who brought 5 fish to the scales for 17.69 Lbs. with a big fish of 4.69 lbs. Tenth place money was collected by the team of Mike Piccolo and Bill Ville who brought 5 fish to the table for 17.61 Lbs. with a big fish of 4.69 lbs. Eleventh place cash went to the team of Ben Werbos and Tom Best who brought 5 fish to the scales for 17.24 Lbs. with a big fish of 5.67 lbs. Twelfth and final cash spot was won by by the team of Fran Pratt and Matt Pratt who brought 5 fish to the scales for 17.16 Lbs. with a big fish of 4.91 lbs. First team to finish just out of the money was awarded a $ 50.00 gift card from Cabela's at the Christiana Mall. 13th position and the The Cabela's card went to Ron Caldeira and John Oldaker who brought 5 bass to the scale weighing 17.04 Lbs. with a big fish of 4.81 lbs. 14th place earned a $50.00 set of Cal Coast Fishing Clip n Culls, the non puncturing type of cull tags that hold tight with a vise grip type mechanism. 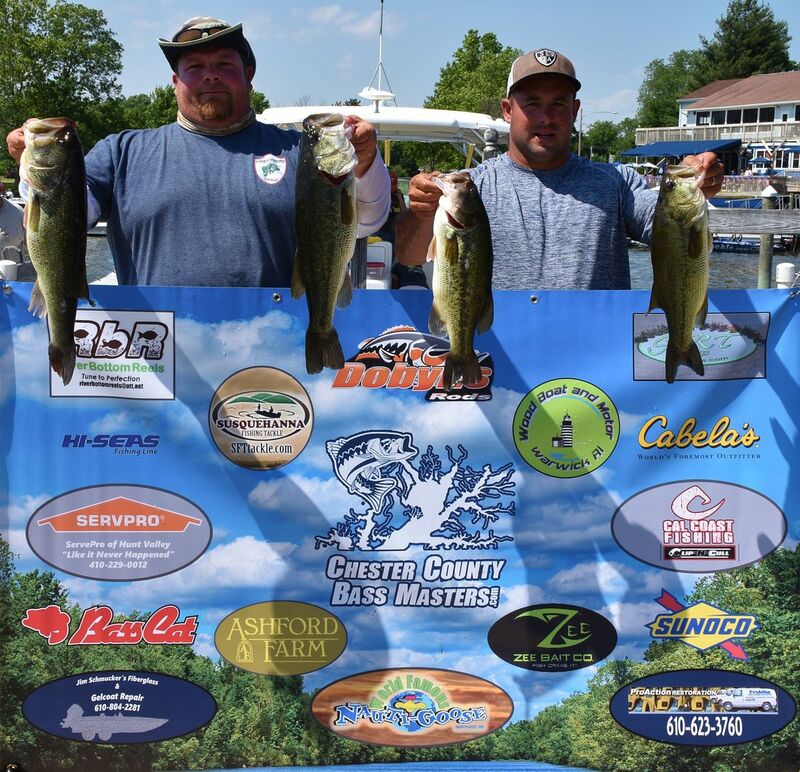 Jon Cussenello and Logan Fitzpatrick weighed in a limit of bass for 16.77 pounds with a big fish of 4.91 lbs. 15th place earned a $ 50 Zee Bait Company card. 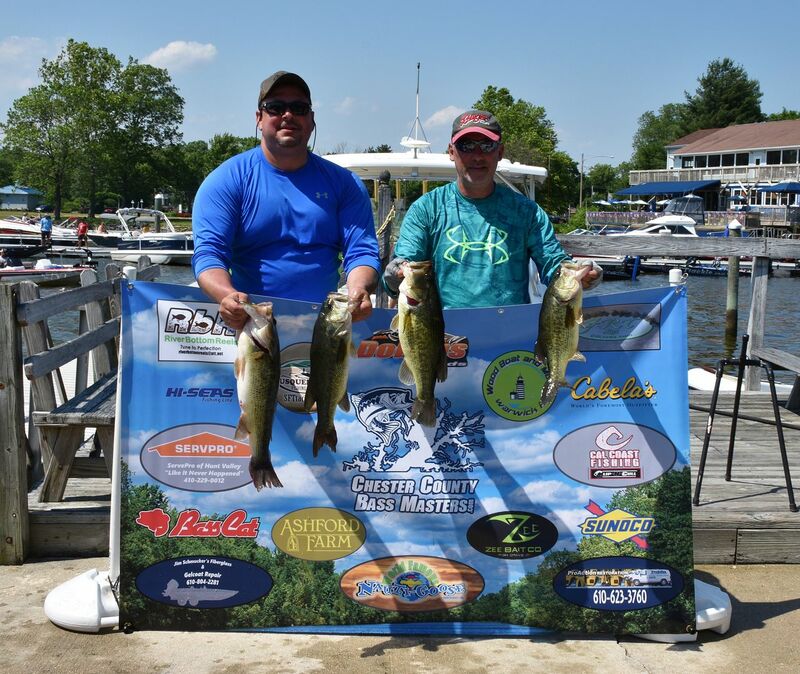 Travis Manson and Eric Galasso were one short of a limit with 4 bass for 16.62 Lbs, a nice average which included an outstanding 6.22 big fish. 16 thru 23rd spots won gift cards from River Bottom Reels, Nauti Goose Restaurant, GRT Jigs, Sunoco, or certificates for 40 % off Dobyns Champion Extreme, Champion and Sierra Series rods, or a Hi Seas line pack. 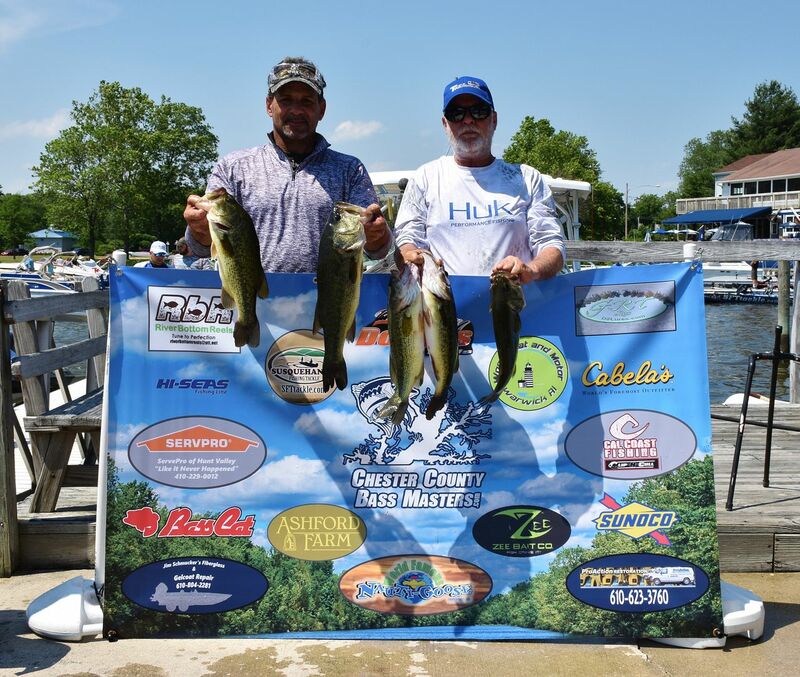 16th place was Earnest Leiphart and Charles Leiphart with a 5 fish limit of 16.33 lbs and a nice 5.03 big bass. 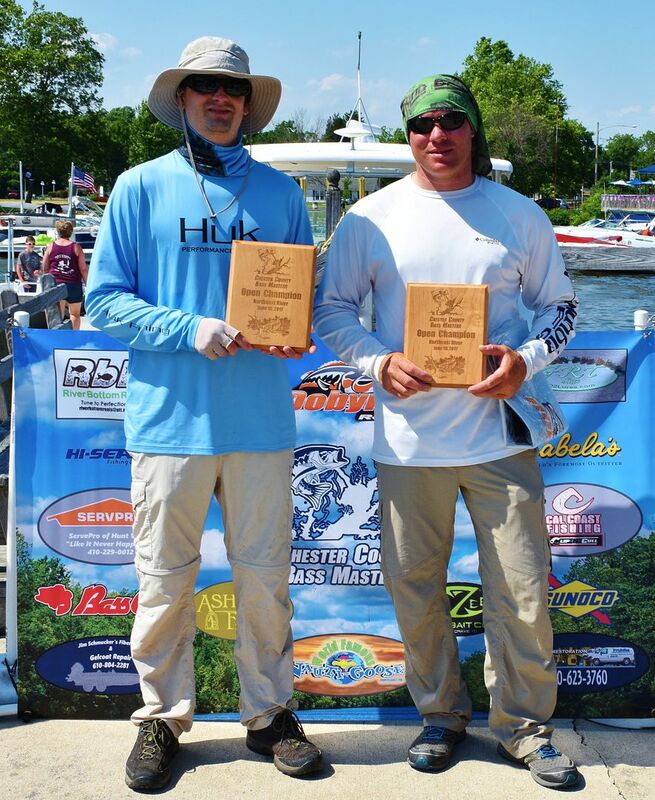 17th place went to Dave Mcullogh and Justin Harant who brought in 5 fish for 16.02 lbs with a 4.25 lb big fish. 18th place went to Sean Geerlof and Stan Horne with 5 bass for 15.95 lbs. 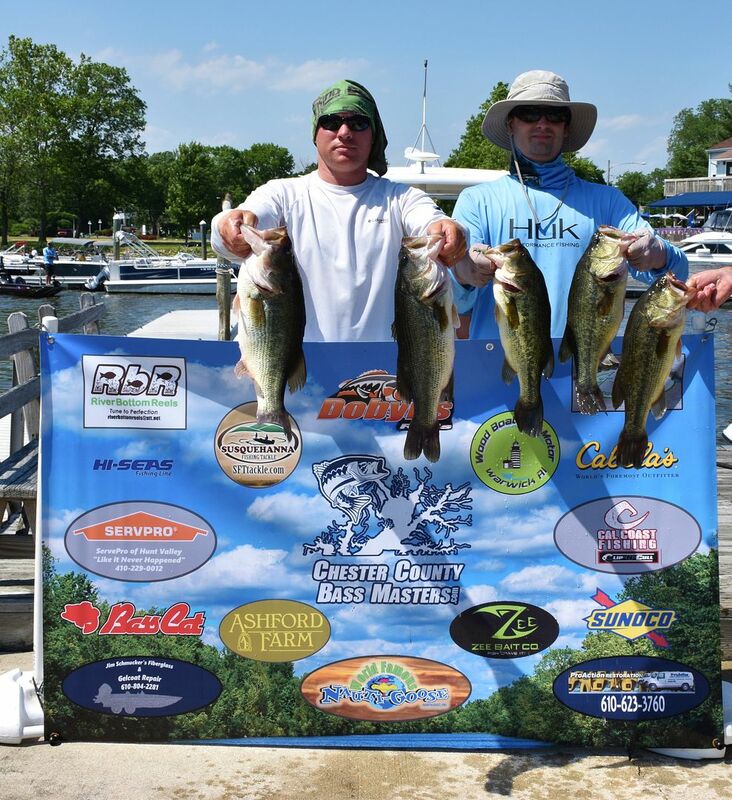 19th spot went to Don White and Ralph Kappenstein with a limit of bass weighing 13.22 lbs and a 3.36 big fish. 20th position was Joe Booker with 4 fish going 12.78 lbs and a 4.51 big fish. 21st spot was Steve Hannah and Russ Wright who brought in 5 fish for 12.59 lbs. 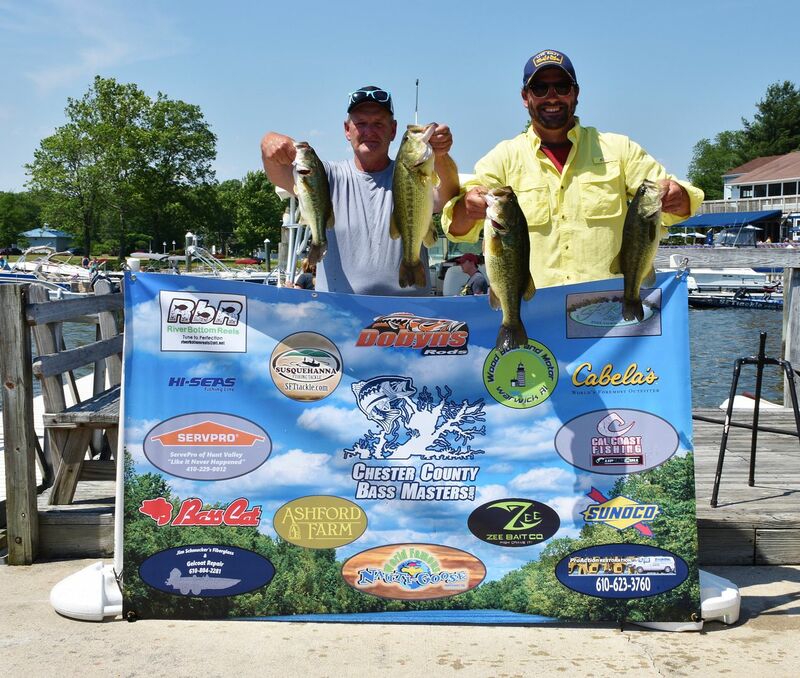 22nd place was Kevin Geesey and John Kopp bringing in 4 bass for 12.18 lbs with a big bass of 4.89. Kevin is the owner of River Bottom Reels, an excellent reel repair service, quick reliable service, check them out on facebook. 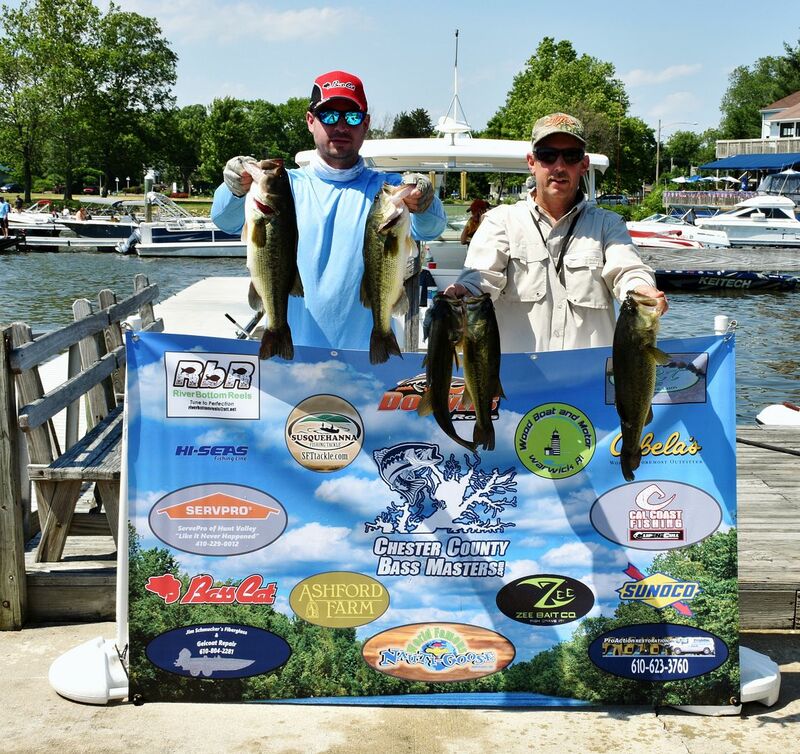 23rd spot and last sponsor spot went to Jim Hauck and Sam Montalto who brought in 3 nice bass for 10.82 lbs with a 4.40 big fish. 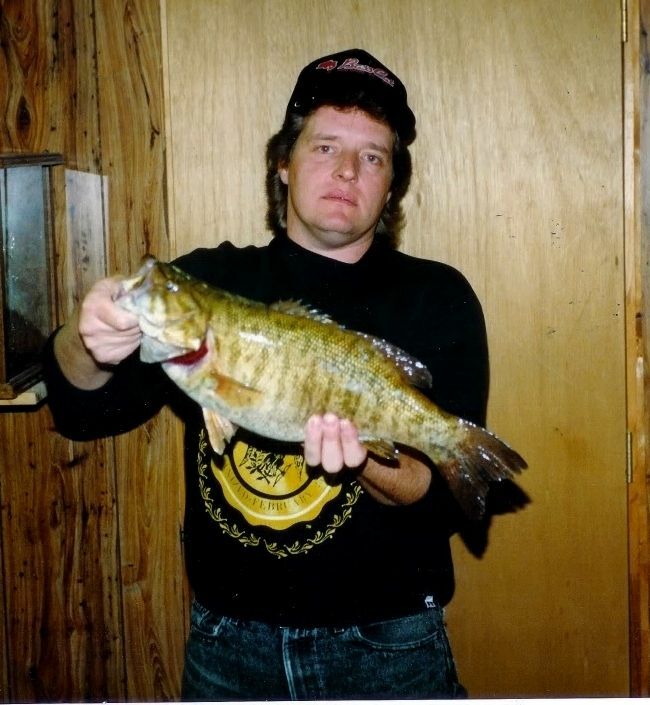 4 - Gerlach / Ely - 5 fish - 19.55 lbs. - big fish - 4.72 lbs. 5 - Burger / Burger - 5 fish - 19.49 lbs. - big fish - 4.77 lbs. 6 - Cowan / Valdez - 5 fish - 18.99 lbs. - big fish - 5.07 lbs. 8 - Plank / Noeth - 5 fish - 18.31 lbs. - big fish - 4.86 lbs. 9 - Anderson / Macsherry - 5 fish - 17.69 lbs. - big fish - 4.69 lbs. 10 - Piccolo / Ville - 5 fish - 17.61 lbs. - big fish - 4.69 lbs. 11 - Werbos / Best - 5 fish - 17.24 lbs. - big fish - 5.67 lbs. 12 - Pratt / Pratt - 5 fish - 17.16 lbs. - big fish - 4.91 lbs. 13 - Caldeira / Oldaker - 5 fish - 17.04 lbs. - big fish - 4.81 lbs. 14 - Cusenello / Fitzpatrick - 5 fish - 16.77 lbs. - big fish - 4.91 lbs. 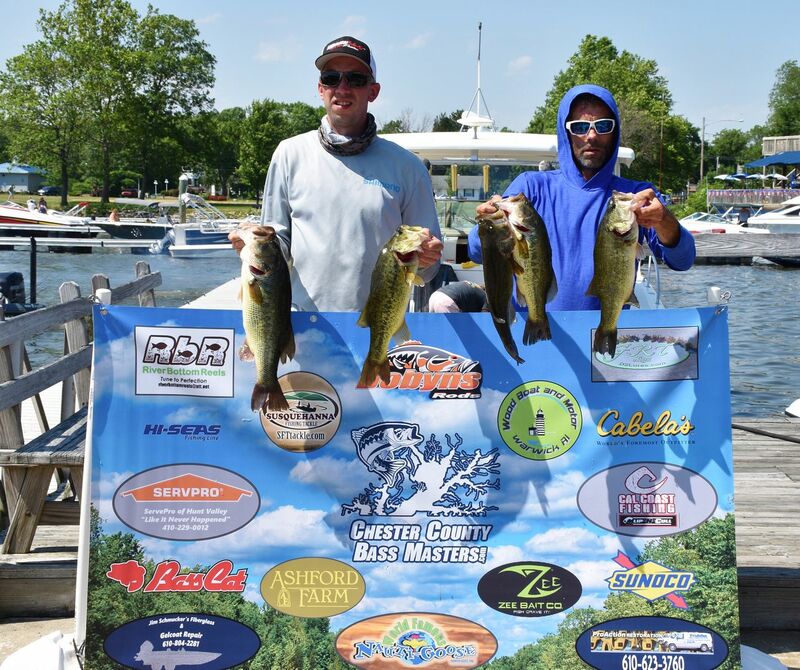 15 - Manson / Galasso - 4 fish - 16.62 lbs. - big fish - 6.22 lbs. 16 - Leiphart / Leiphart - 5 fish - 16.33 lbs. - big fish - 5.03 lbs. 18 - Geerlof / Horne - 5 fish - 15.95 lbs. 19 - White / Kapperstein - 5 fish - 13.22 lbs. - big fish - 3.36 lbs. 20 - Booker - 4 fish - 12.78 lbs. - big fish - 4.51 lbs. 21 - Hannah / Wright - 5 fish - 12.59 lbs. 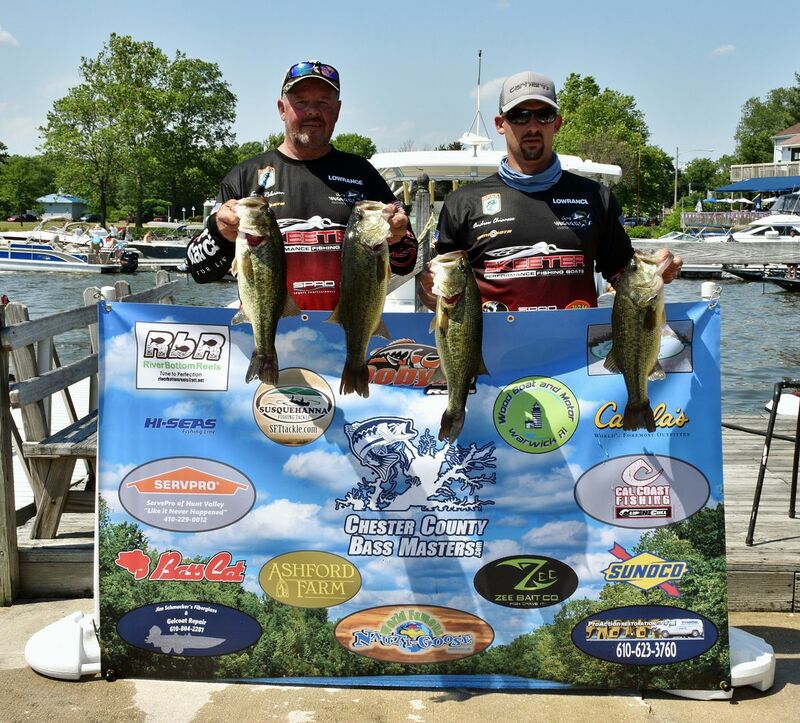 22 - Kopp / Geesey - 4 fish - 12.18 lbs. - big fish - 4.89 lbs. 23 - Hauk / Montalto - 3 fish - 10.82 lbs - big fish - 4.40 lbs..
24 - Yeekly / Young - 4 fish - 10.48 lbs. 25 - Williams / Dise - 3 fish - 10.12 lbs. - big fish - 3.61 lbs. 26 - Kunkel / Smith - 3 fish - 9.85 lbs. 27 - Barlow / Messina - 3 fish - 9.80 lbs. 28 - Griffin / Murphy - 3 fish - 9.26 lbs. 29 - Sirochman / Sirochman - 3 fish - 8.86 lbs. - big fish - 4.23 lbs. 30 - Amilani / Curcu - 4 fish - 8.80 lbs. 31 - Stalb / Stalb - 2 fish - 8.24 lbs.- big fish - 4.37 lbs. 32 - Savidge / Young - 2 fish - 7.90 lbs. - big fish - 4.47 lbs. 33 - Stewart / Paus - 3 fish - 7.78 lbs. - big fish - 3.98 lbs. 35 - Heckman / Bowe - 2 fish - 6.72 lbs. 37 - Zisk / Biondi - 1 fish - 4.30 lbs. 38 - Casselli / Patton - 2 fish - 4.24 lbs. 39 - Helmetag / Helmetag - 1 fish - 2.94 lbs. 40 - Newcombe / Dan - 1 fish - 2.49 lbs. Bass Fishing is like Church, many attend - Few get it.